On the Macintel front, there are now over 1,000 programs running natively on Apple's newest hardware, and yet another project is getting Linux and Windows XP up and running on Macintel hardware. Perhaps the week's most interesting news concerns ultramobile PCs, handheld devices smaller than a tablet and larger than a Palm. This size should be familiar to anyone who has ever used a Newton, but the ultramobiles will have color displays and may have pop-out keyboards. Apple, how about it? Finally, lots of news on the Intel front with Yonah, Conroe, and Merom among those mentioned. For those who can't keep all of those code names straight, we're hoping to publish a series of articles covering each of them in the near future. Ultramobile Future: Implications for Apple? "Apple CFO Peter Oppenheimer said Tuesday that more than 1,000 applications have been ported to the Intel-based Macintosh platform, but he admitted that some key software is experiencing performance challenges. "Speaking at the Morgan Stanley Semiconductor and Systems Conference, Oppenheimer said Apple is still running about a year ahead of its planned transition to the Intel platform. 'There are 1,000 applications that are universal today, with more coming,' he said. "But some applications, such as Adobe Photoshop, haven't been optimized for the Intel Macs, Oppenheimer added. 'For power users, they are going to notice a difference [in performance],' he said. 'They may or may not find that acceptable.'" "What if Apple had switched to Intel processors at the very beginning of the Mac OS X era? This may seem a perfectly absurd question, but stay with me now. From a practical standpoint, it may have had disastrous results for developers. Imagine the pain they underwent moving their products from Classic to Mac OS X, and imagine having to recode for a new processor at the very same time. You can see where many might have just deserted the platform altogether, but consider what might have resulted had they simply endured the extra pain of a double migration." Link: The Secret of Getting Maximum Mac OS Performance: Go Intel! "Given that Intel-based Macintosh computers have neither a legacy BIOS nor a legacy VGA BIOS, it is rather non-trivial to boot an x86 operating system using legacy means on these machines. "We have developed software ('BAMBIOS') that allows such legacy booting on the Intel-based Macintoshes. For example, a regular (that is, non-EFI) version of Linux can be readily booted using this software. "We are excited about the possibilities of using this software to multiboot several operating systems on the new Macintosh hardware. Linux works fine, and we have made good progress with booting an unmodified Windows XP installation (no 'piracy' required :-))." "Intel will put NAND flash chips into notebook PCs beginning next year. "The Santa Clara, Calif., chipmaker said Tuesday that the NAND flash feature in its forthcoming notebook platform, dubbed Santa Rosa, would offer the main benefit of decreasing the time it takes to turn on a PC. "The news comes roughly three months after Intel announced that it was forming a joint venture with Micron to produce NAND flash chips. The joint venture's first announced customer was Apple, which will purchase $500 million worth of NAND chips to go into its iPod players. "Intel's move to incorporate NAND flash into a notebook platform would mark the first major extension of NAND flash into PCs." "Accessing a disk drive is hundreds of times slower than accessing main system memory. Flash memory is slower than the DRAM used for system memory, but it's still far speedier than pulling data from rotating magnetic media. If you've ever waited for a large game level to load, you'll know what we mean. There you sit, with the hard drive light flickering, staring at a progress bar on the screen. For this, you've paid $50? "But it's not just a matter of loading applications faster. One of the major sources of battery drain in a notebook PC is its spinning media. If you could get data from a large flash memory cache instead of spinning up the hard drive, you'd save a lot of power. Boot times would speed up substantially, too. Since a flash cache is nonvolatile, powering up from hibernate would be quicker and use less power than coming out of hibernation using the hard drive. Add the fact that hibernation uses less power than standby mode, and you can see the potential for big power savings." "There are three points to keep track of: First, the Ultramobile PC isn't a tiny notebook - it is something else entirely. Second, this class of device will lend itself to customization and likely morph into a variety of form factors over time. Finally, this product will probably do the most to define Web 2.0 from a hardware standpoint - and will also be defined by it. "Last week, Intel held its Developer Conference, an annual event where the company showcases the changes it plans to make in its next-gen products. With Microsoft's new operating system due to hit the market in a few short months, Intel planned more dramatic changes this year than would typically be the case. "Thanks to its new ties with Apple, we got an unprecedented look at future hardware offerings from that company as well. The presentation was impressive. It included the first meaningful showcase for Viiv, which suddenly seems to make sense to me. 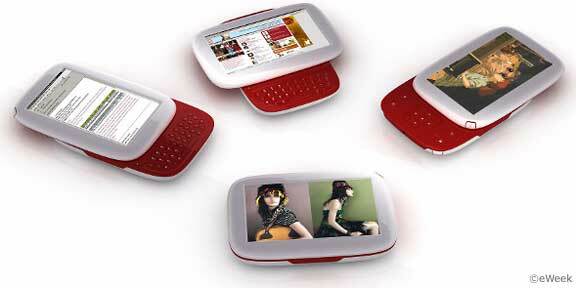 "Also last week, Microsoft launched its Ultramobile PCs, codenamed 'Origami.' These could have more impact on personal computing than the PC ever had. For Apple and Microsoft, the future looks bright." Link: Intel's Bright Future: Are There Implications for Apple? 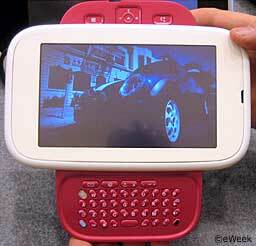 eWEEK.com provides a slideshow of new concepts and designs for future ultramobile PCs from Intel. See the winners, the losers, and the just plain weird. We've included two of these images in today's Macintel Report. "The upcoming Yonah processor is needed to balance the competing demands of performance and mobility in handheld PCs, an Intel Corp. executive said Wednesday at the company's Spring Intel Developer Forum in San Francisco. Although Sean Maloney did not name the device he held in his hand during a keynote presentation, its dimensions appeared to be similar to a handheld built on Microsoft Corp.'s Origami project. "On Wednesday, Samsung Electronics Co. Ltd. at the Cebit trade show in Germany showed the Q1, built on the Origami concept, and falling somewhere between a tablet PC and a PDA (personal digital assistant) in size and ability. "Ultramobile PCs need what Yonah will offer, said Maloney, Intel executive vice president and general manager of its mobility group. Yonah is the dual core version of the Pentium M. It offers better power efficiency than a conventional dual-core processor because it uses a shared cache of memory, he said. That allows both cores to access data without connecting to the frontside bus, a step that demands time and power. That strategy also allows Yonah to save energy by switching off 'micro logic areas' of the cache while they are not being used." "You have to hand it to Intel for talking about power management and the benefits of multi-core processing with such confidence. Using reality distortion, Intel has convinced itself that it pioneered such technology instead of being the lone laggard to catch up with the rest of the industry. "At the Intel Developer Forum, various executives spun the yarn about Intel taking power consumption issues seriously years ago. In addition, the company long had an ambitious multi-core processor plan in place, we were told. Now Intel will combine the fruits of all this work to crush the competition on a performance per watt basis." "Intel is not taking the recent gains made by chip rival Advanced Micro Devices lightly, according to CEO Paul Otellini. "Otellini, in an interview with reporters at the Intel Developer Forum here on Tuesday, said that the company's manufacturing capabilities and new chips coming later in the year will put it in a position to regain some of the market share recently ceded to AMD. "'The No. 1 competitive asset is the sheer scale of the 65-nanometer, 300-millimeter manufacturing capacity,' he said. By the end of the year, Intel plans to have four of these factories running, and its 90-nanometer factories, currently used to produce many chips, will start making chipsets. "AMD is expected to begin 65-nanometer manufacturing in the second half of 2006. The shift to 65-nanometers should enable both companies to produce faster chips at less cost." "Intel has confirmed that 'Kedron', its roadmapped next-generation wireless network adaptor, will support 802.11n, and made public the name and release window of the next incarnation of its Centrino platform: 'Santa Rosa', based on the 'Crestine' chipset, which is due to ship H1 2007. "Indeed, Intel yesterday confirmed roadmap leaks by noting Merom will ship in time for the Christmas 2006 buying season. It will be pin-compatible with current Core Duo processors." "At the 2006 Intel Developer Forum, Intel showed a Conroe system running existing generation PC games faster than an AMD system. And not only was the Intel system running at 2.66 GHz - a slower clock rate than the top Pentium 4-it was outpacing an overclocked Athlon 64 FX-60. Wrap your brain around that idea for a bit while we dive into the architecture of Intel's new progeny. "Listening to Intel discuss the new architecture benefits is somewhat reminiscent of listening to AMD talk about the Athlon 64 several years ago. Much of the discussion revolves around instruction efficiency (fewer cycles per instruction), lower power usage, and so on. But while Intel may be sometimes slow to respond to market pressures when they make a shift, the entire company enthusiastically moves in the new direction. By the time the smoke clears, it sounds like Intel invented the concept of IPC." "Intel will continue riding the bus route. "Executives at the chip maker, in a high-level discussion of its Core Microarchitecture at its spring Developer Forum, here, said that the company's bus approach - using a series of pipelines and a discrete controller to shuttle data between its processors and memory versus directly connecting the chips - still has legs." "Intel is assembling the building blocks for a radically different chip architecture that could arrive by the end of the decade. "Although the chip giant officially announced its Core Microarchitecture at its spring Developer Forum, here, researchers at the company have already been working on a potential follow-on that will be capable of harboring tens of cores, far more than the Core Microarchitecture and its predecessor, which is already in development at the moment, Intel executives said." "Intel has begun a partnership to help a start-up, Transitive, with software that enables computers with Intel chips to run programs written for rival processors. "Transitive's translation software will be used to let software from rival RISC (reduced instruction set computing) processors run on Intel's Itanium and Xeon server processors. The partnership is designed to make it easier for customers to scrap competitors' gear in favor of Intel-based systems." Transitive is the company that developed the Rosetta software used on Intel Macs.